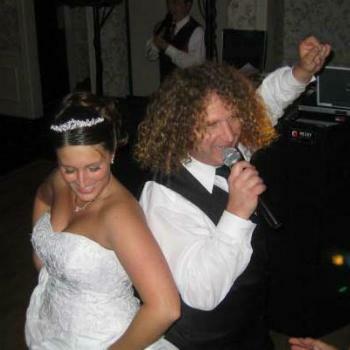 If there was ever a person who could give the Energizer Bunny a run for his money, it would be "Jammin" Jim Bello. Jim is a high-energy entertainer who will do anything to get a laugh (well...ALMOST anything!). But don't think that Jim doesn't take his job seriously. He is dedicated to his craft and really enjoys showing everyone in attendance a great time. 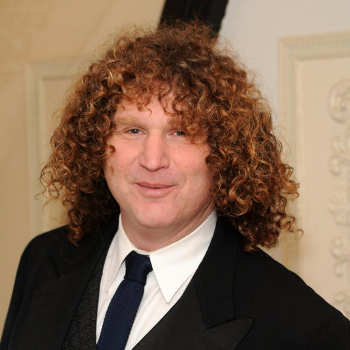 Jim is the person responsible for inventing many of the famous "Fantasy Productions Dances" that are used during the audience participation segments of our parties. It seems that Jim was born to entertain. 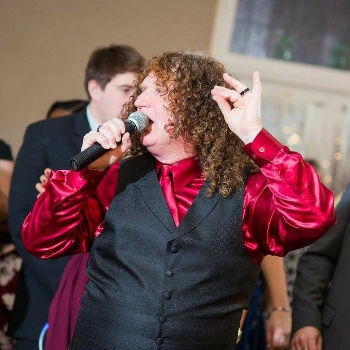 When he is not behind a microphone for Fantasy Productions, Jim finds other mics to work behind as an on-air personality at FM-Station "Jukebox Radio" in Bergen County, doing various voice-over work in numerous NY/NJ area media outlets and even playing in a band! 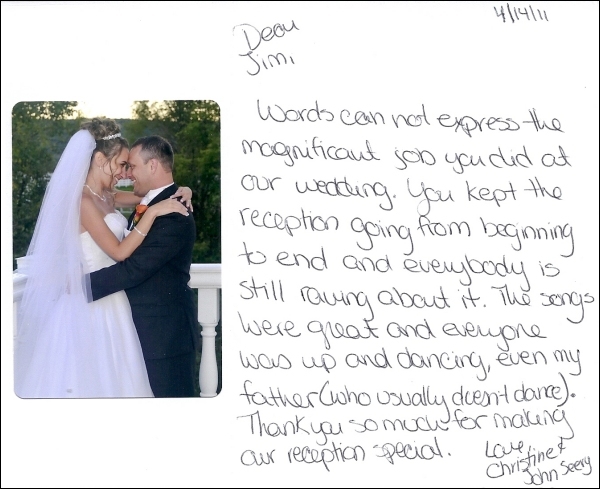 Jim cherishes the time that he spends with his wife Cindy. Among his interests when he's not holding a microphone: The NY Yankees, playing guitar and karaoke. 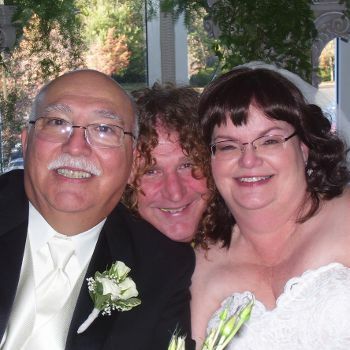 Veteran of over 900 parties, including 450+ weddings. Veteran actor of theatre and television. 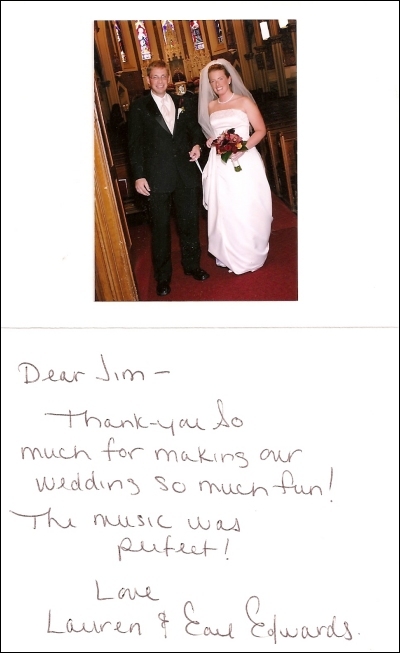 I just wanted to take the time so say thank you so much for doing such a fantastic job with our wedding reception music! 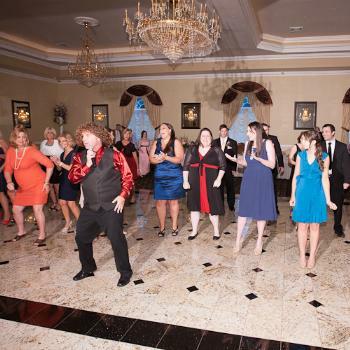 Adam and I were on the dance floor all night long, and I don't think there was ever a moment when it was empty. 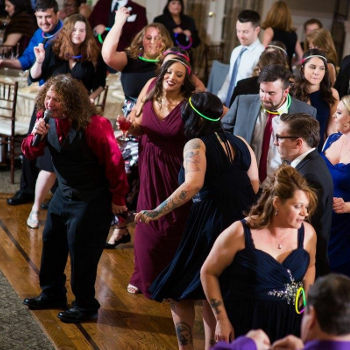 We loved how you started the party right away, even before dinner started, with a big audience participation song—your energy and great dance tutorial got everyone on the dance floor, even people who I wouldn't have imagined ever dancing. 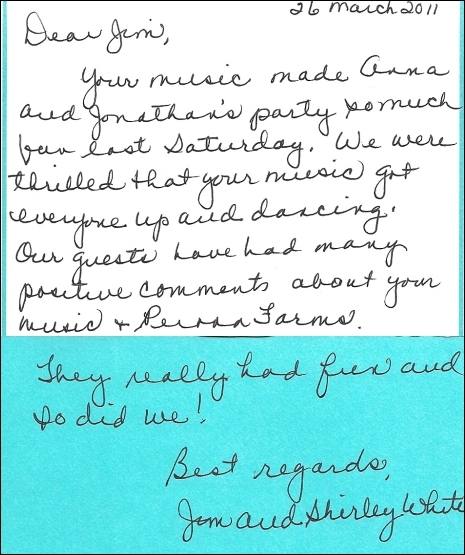 My only "complaint" is that we were barely able to leave the dance floor to make our rounds, since you just kept playing great song after great song, and we didn't want to stop dancing! 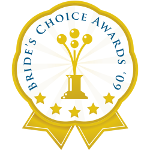 You did a top notch job of reading the room and changing the pace or genre, and were able to deliver on everything we had requested. 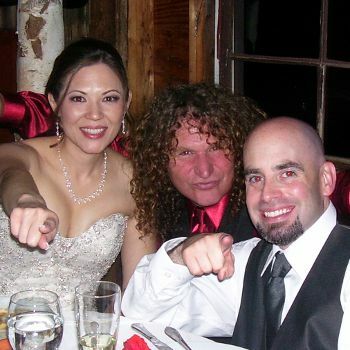 We had many people tell me at the wedding and after that they LOVED our DJ! Thanks again! All I can say is Thank You, Thank You, Thank You for making our wedding day the most amazing day of our lives. From the time we first sat down together we knew YOU were our guy. You took the time to listen to our eclectic taste in music and met every whim and request we had. All of our guests (and us) were so impressed with your style, charisma and undying energy. We had a blast. I can't wait till the Anniversary Party so we can do it again. 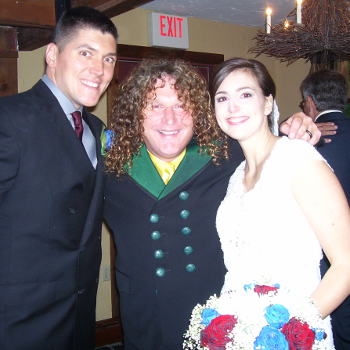 Paul and I just wanted to thank you SO much for all that you did for our wedding! Your hardworking spirit and dedication to us was evident from the day we started working with you. 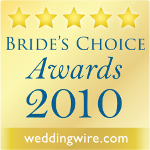 I was immediately impressed by how you reached out to us right when we booked you. 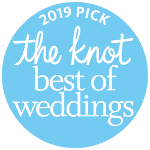 We saw that you really wanted to get to know Paul and I as a couple to give us the best wedding experience possible, and that was priceless. We are so happy we got an opportunity to work with you. 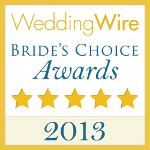 Its been over a week since the wedding and we are still hearing my guests talk about how wonderful you were! Everyone truly enjoyed your warm, fun, personable personality. From the minute you started DJ-ing people were on that dance floor having a blast. I don't think there was one moment where people weren't up and dancing! Not only were you dedicated to giving our guests a great time, but we also appreciated you going out of your way throughout the night to make sure Paul and I were enjoying it too! We already have and definitely continue to pass on your name to others. 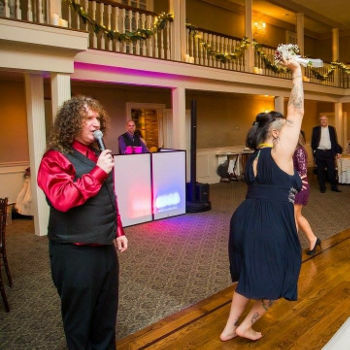 Just want to say a huge thanks for the fantastic job you did at our wedding on July 4th! We had an amazing time! I wanted to thank you for such a fabulous job!! he music was perfect. I have never seen a dance floor so full. Sorry we were a little crazy. I was so excited and had a little too much fun :) Hope you were good with everything. We will definitely refer you to everyone! Happy New Year! 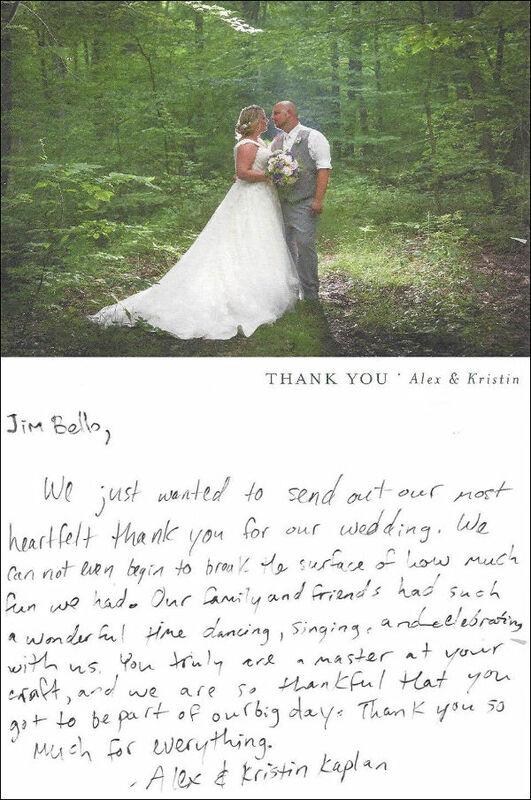 I just wanted to write to you to say thanks so much for the work you did for our wedding. You did a fantastic job. We really loved how you got everyone going and excited and got them ready to party. 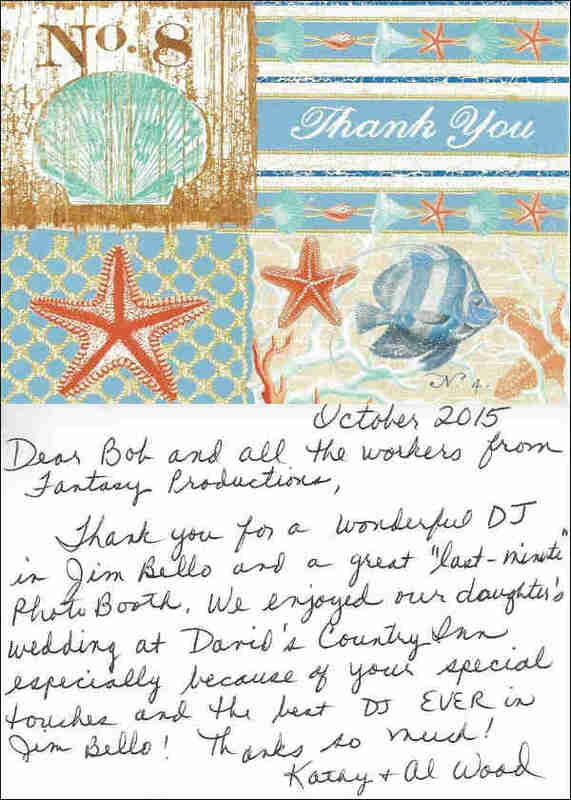 I have had so many compliments about the wedding and many of them were about how great the DJ was. We will definitely be sure to use you for our future parties. As our family will grow I know you will be able to help us in celebrating many more family get togethers and parties. If you ever need a reference for anyone don't hesitate to contact me. I'd like to thank you for everything you did to make our Wedding Reception JUST PERFECT!!!!!!! 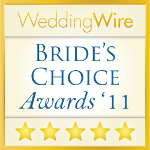 We heard RAVE reviews from our guests. Most times, it is the music that makes the event. In our case, you not only pulled off every whim we asked for, but you improvised and went with the moment! 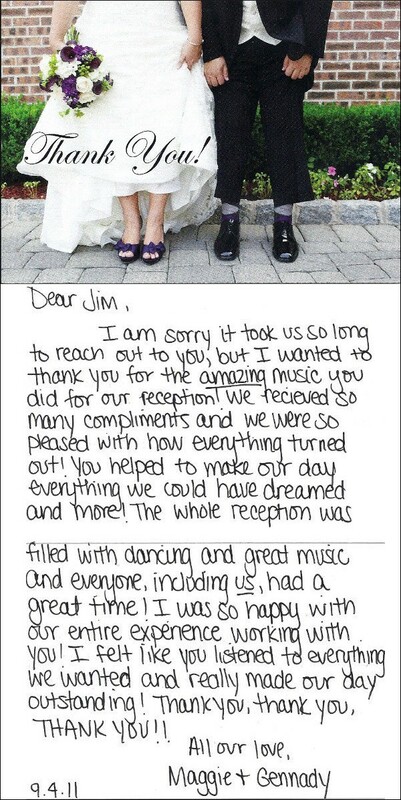 Please continue to spread your talents to other couples events. Where I can offer my experience as a reference to others, please pass along my email address. Jim, we asked for the moon, and got the whole galaxy! You have a true gift and your hard work shows itself in the superior end result. Thank you for making our evening, our wedding, our year!! We hope you're all doing well. 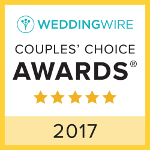 We just wanted to send a Thank You for all your help with the wedding. 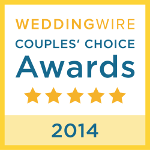 You were all so dedicated to making our wedding such a special and memorable experience. 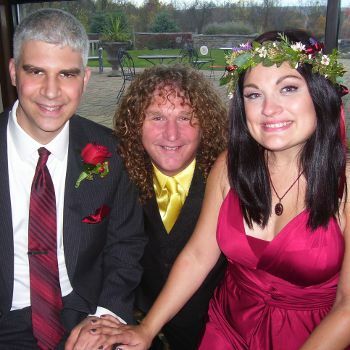 Our wedding day turned out so wonderful and you all had a part in making that happen. Jim did such a great job! He went out of his way to make sure we where happy and we appreciate that very much. Each of you took the time to help in any way that you could and for that we say "Thank You". It sets you apart from all the rest. We wish you all the best! Well, I believe that my head is on straight now so I can take the time to e-mail my thanks to you, and hope that you will pass along to Jim Bello. That man was fantastic! Everyone commented on how great he was and what a good time they had. 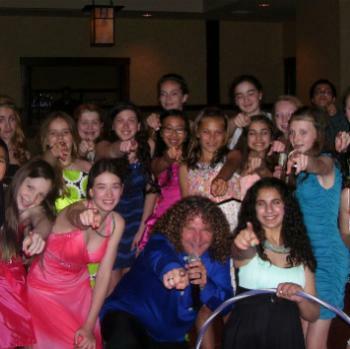 He even got the most shy, reserved people out on the dance floor! I know that he was disappointed in losing some floor time to the Irish step dancers we had, and maybe worried about that a bit, but he gave us such quality that he needn't worry. We all know that quality is better than quantity. Thanks to him, all went well and everyone had a blast. Again, thanks to Jim (and to you for sending him) and his mixer whose name I forgot. 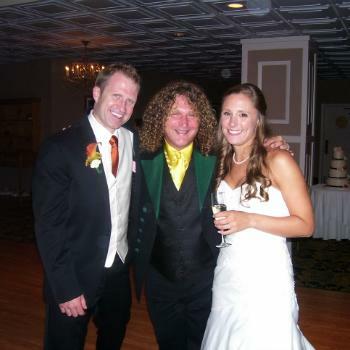 They helped make Lindsay and Darrell's day such a huge success. He delivered more than we could have hoped for and we love him for that. I will be sure to pass your name around to anyone who is planning a celebration that may need a DJ.